The latest issue – Q3/Q4 2017 – of the RCI Ventures business magazine serving the EMEAI region is now available. As a fiercely brand-loyal consumer myself, I know how hard it would be to persuade me to buy into another product once I have grown to love a product or service I have bought into. I completely understand the value of hitting your consumers’ sweet spot – to keep them coming back for more. One of RCI’s key clients describes how much work they’ve put into doing just that. 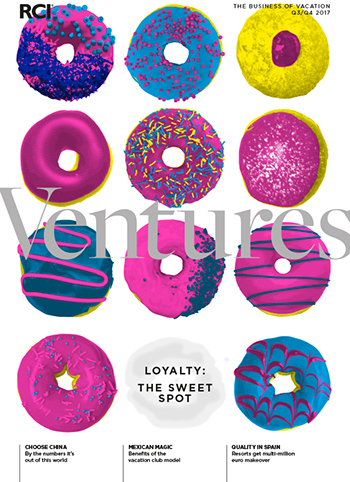 In our lead feature, Loyalty: Hit the Sweet Spot. Peter Booth, Vice President of the Pestana Group, and Paul Roberts, Sales Manager at the Pestana Vacation Club, share the process of product and strategy review undertaken at its Madeira Beach Club when it went back into sales earlier this year. Literally all aspects of the resort’s assets and product have been scrutinised in a process that sees the introduction of complete flexibility in the holiday options it now offers. The reinvention of the Pestana Vacation Club product is based on a re-engineering and repackaging which maximises the use of the group’s diverse property and asset portfolio. Short-term ownerships, new guest experiences, and the recently-launched Pestana Options programme which encourages deeper engagement with the group’s multi-tiered membership and ownership packages, are all features of Pestana’s new world. These moves are not only attractive to new purchasers, but have become the basis of a robust owner referral programme for Pestana, all of which has resulted in vital organic growth, with a 50 per cent completion of its projected sales by the end of the year. There is no quicker way to hitting the consumer sweet spot than to present a quality product that represents value for money. In this issue we showcase a number of resorts in Spain that have invested significantly in delivering a quality experience after carrying out multi-million euro refurbishment programmes. While at the RCI-affiliated Brockwood Hall Lodges, a collaboration with Hoseasons’ Wanderwood Lodge Holiday Collection has delivered a remarkable increase in revenues during the shoulder season months for Brockwood, which showed a 63 per cent lift in revenues during Q1 this year, following the collaboration agreement. Over in the Latin American market, we look at a number of clubs committed to delivering their own unique luxury lifestyle to set their offering apart from the best of the rest, and we ask if those business models will pay dividends in the European market. Of course the big story is China… This vast nation is making both business and political headlines the world over right now, and so RCI Ventures turned the spotlight on the opportunities within this country for the hospitality and shared-holiday ownership industry. Several hospitality professionals give valuable insights into the breath taking numbers and surreal statistics that could be game changers for those who are willing to invest the time, energy and money in working in collaboration with their Chinese counterparts. For an inspiring read and to view the latest issue of RCI Ventures, see below.